CKK Mobile’s latest offer to us is the Duke 8 smartphone with 5.5-inch screen that runs on Android 6.0 Marshmallow operating system. If you’re looking to buy a phone under 4,000 pesos budget, then consider this product of CKK mobile on your list. You can have most needed features of a smartphone with Duke 8, from call, text, internet and multimedia for only 3,499 pesos. Another plus is the 5.5-inch screen that is equipped with QHD IPS capacitive touch display. You’ll have no problem in using this phone in bright and low lights with the help of IPS technology features. Duke 8 is powered by a quad core processor clocked at 1.3GHz paired with 1GB of RAM, which is enough to handle light to medium task you run on this phone. 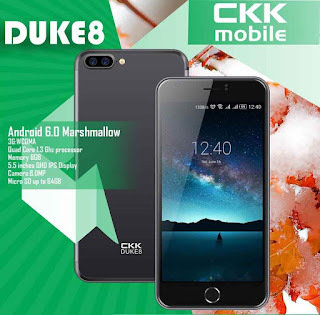 From surfing, social media apps, music, games and video playing, all that things are very possible with CKK Mobile Duke 8. Available in color black, white and pick.